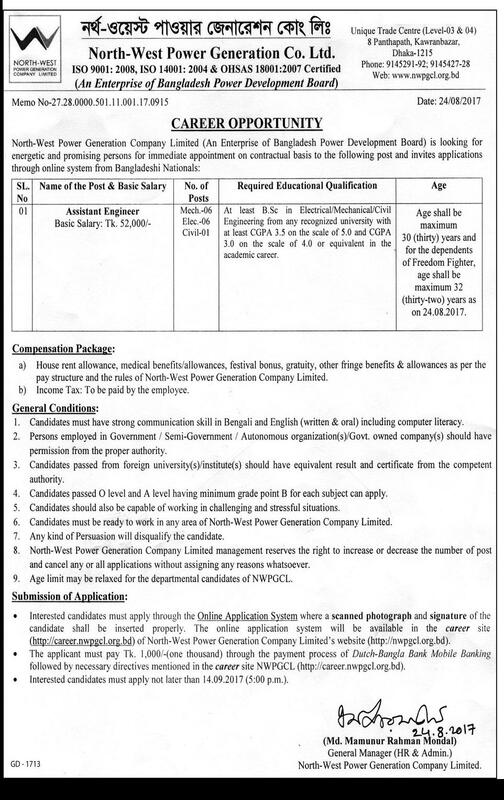 Bangladesh Power Development Board Job Circular 2017 has published on Newspaper and their official website at www nwpgcl org bd. 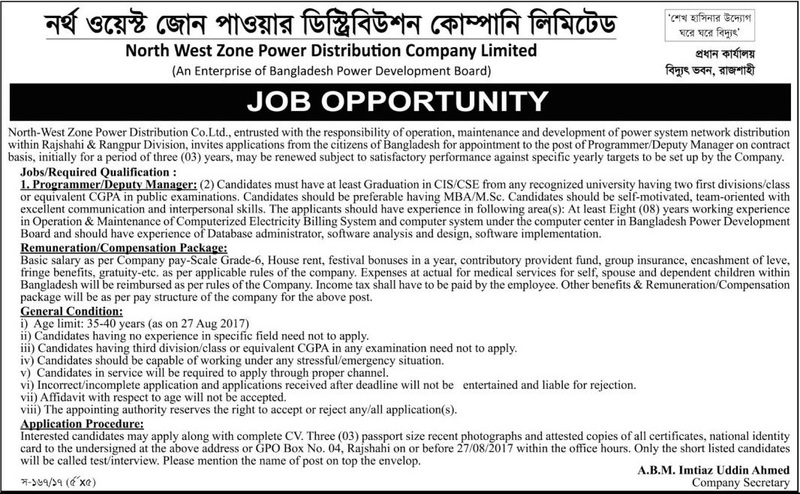 Bangladesh Power Development Board job circular 2017. BPDB will recruit some personnel for eligible candidates under this circular. Interested and eligible candidates must apply by 27 August & 14 Septembeer 2017. Prescribe Application Form you can download from www bpdb gov bd and BPDB Head office Dhaka and Production Zone Chief Engineer office of Dhaka / Khulna / Chittagong / Mymenshing /Comilla / Sylhet. Bellow you have to see the Bangladesh Power Development Board Job Circular 2017 details and qualification to apply. BPDB is a statutory body created in May 1, 1972, by presidential Order No. 59 after bifurcation of erstwhile Bangladesh Water and Power Development Authority. BPDB started its operation with Installed Generation capacity of only 200 MW. Installed Generation capacity (August 2014) has increased to 10618 MW. The Bangladesh Power Development Board has taken a massive capacity expansion plan to add about 10500 MW Generation capacity in next 5 years to achieve 24000 MW Capacity according to PSMP-2010 by 2021 with the aim to provide quality and reliable electricity to all the people of Country for desired economic and social development. The power system has been expand to keep pace with the fast growing demand. 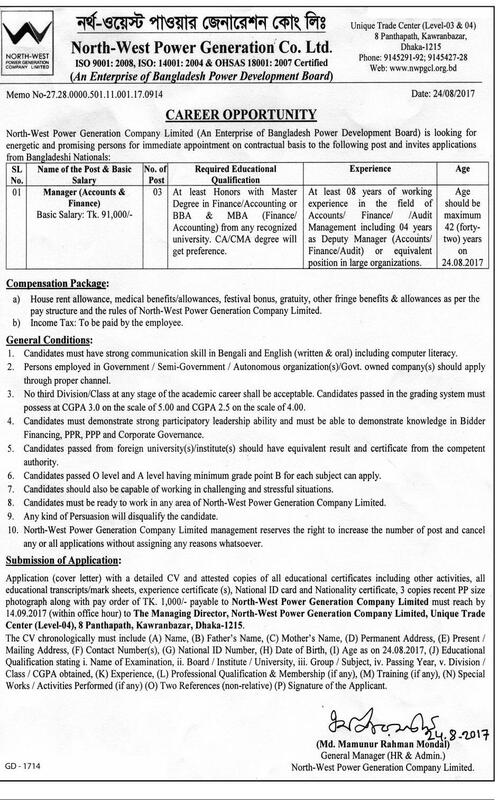 ■ Job Description: Bangladesh Power Development Board (BPDB) has been published Recruitment Notice of Sub-Assistant Engineer(Mechanical); Sub-Assistant Engineer(Electrical); Sub-Assistant Engineer(Civil); Junior Assistant Manager (Chemical); Junior Assistant Manager (Store) & Manager (HR/Admin). Bangladesh Power Development Board Job Circular 2017 recruited all job category of Engineering level. There are more things for application submission. You should read carefully the advertisement which is mention there. We will update the next written exam and result of Bangladesh Power Development Board Job Circular 2017. Candidates must face the written exam and viva for final selection. So you will get the Admit card; written exam seat plan. We will also update Bangladesh Power Development Board Job Circular 2017 written exam result via www bpdb gov bd. There are need to attach some documents with application form. You may check the list on the advertisement. If there is found any wrong information on application from the candidates will be rejected as well. If you latest government jobs circular news with right time to connect with khulnajob.com. We Make sure all types of latest jobs news/ information such as all private bank jobs; news; private university lecturer jobs in Bangladesh embassy jobs in Bangladesh; prothom alo jobs; government; and jobs in Bangladesh; most recent jobs in Dhaka; Bangladesh Power Development Board Job Circular 2017 new; airlines jobs in Bangladesh and so on. Our main aim becomes a best jobs circular website in Bangladesh. So just; keep connected with us as well as like our Facebook Page and join with Facebook Group. Hopefully you will be huge benefited by publishing recent jobs circular information.